What is the size and structure of the Sun? The Sun has a core at its center, a radiative zone surrounding the core, a convective zone surrounding the radiative zone, a thin photosphere at its surface, and a chromosphere and corona that extends beyond the photospheric surface. In all, the Sun is about 853,000 miles (1,372,500 kilometers) across, which is about 109 times the diameter of Earth. The different zones and layers in and around the Sun exist because the physical conditions—mostly temperature and pressure—of the Sun change depending on the distance from the Sun’s center. At the core, for example, temperatures exceed 15 million degrees Kelvin, whereas the inner part of the convective zone is just under 1 million degrees Kelvin, and the photosphere is about 5,800 degrees Kelvin. 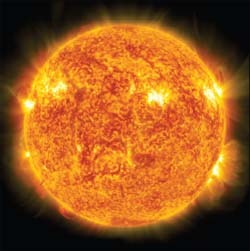 This image of the Sun was created from a collage of pictures provided by NASA.